Super soft, has held up wonderfully after many, many washes. Definitly my go to and favorite sheets. Rejoice every night upon climbing into bed with this sumptuous, buttery soft, and thick set of sheets. This luxurious four-piece sheet set is made from premium 100-percent genuine Egyptian cotton with an incredible 1000 thread count and rich sateen weave. Ten rich and versatile color options provide incredible character that pairs beautifully with a host of different decor styles. I purchased these sheets to fit a special made California King bed with temperpedic mattress topper. Before laundering, the sheets were loose fitting, but after being washed, the fit was one of the best ever. The fabric is very thick and appears to be quite durable. With every laundering, these sheets feel softer and softer, and this is a comfortable, cotton feel not the slick satteen feel of many sheets sold today. Although the price of these sheets was a tad bit more than I generally like to pay, I ordered another set because of the durability and softness factor. These are probably the best sheets I've purchased in many, many years. Fits a 15 inch mattress (even after multiple washings), great! 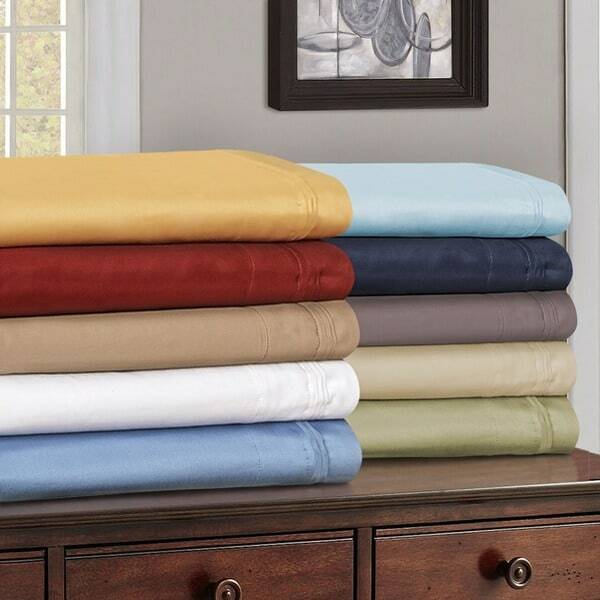 This is a great price for 1000 thread count sheets. The color in the photo is true to the actual color. The fitted sheet has deep pockets and easily fit my 10 inch mattress. Very pleased with this purchase. I was taught that a higher thread count created a more luxurious texture to bedding. WRONG. I've purchased 800 thread count here in the states and loved the sateen type finish of our sheets. So when I saw 1000 thread count I purchased them - noting that the price was in keeping with what I'd seen here for "quality luxury" bedding. While the sheets I received are of good construction, the texture is more like canvas! I went on line to learn more only to discover that thread count is mostly a marketing ploy and it's impossible to get 1000 threads per square inch. http://tlc.howstuffworks.com/home/thread-count.htm These sheets are made in China, which was not evident when I purchased. The label says if desired to wash first, so I did hoping the dryer sheets would help. No! I am very disappointed and do not recommend this vendor or these sheets. Over $$$ is a major rip off. These sheets feel amazing. VERY thick. I've always had 800 thread count sheets, but the 1000 makes that much more of a difference. The quality and color on these are amazing. There was a couple of sizing issues I had though (specifically for a thick queen size mattress). I ordered these sheets because they stated they fit up to an 18inch deep mattress. As I re-read the description now I'm not sure that is what they are saying, but it is confusing. My mattress is a true 18 inches and it doesn't fit nicely. You can get it around the corners, and it stays but there is an upward arch from one corner to the other, it doesn't go under the mattress in the middle. The other thing is that the pillow cases are not standard queen size (this is also stated in the description but I didn't read that thoroughly). If you have queen size pillows, these pillow cases will unfortunately be too small. If you have a thinner queen size bed and smaller pillows I HIGHLY recommend these sheets. I still use them even with their flaws because they feel amazing. If you live in an area that has very cool to cold evenings, then these are for you! They are thick and soft and keep us warm high in the Rockies. However, if you live in a very humid area, these would be way too heavy for summer or warm weather usage. I am using these to replace all the flannel sheets we have acquired before. That is the perfect use, but don't plan on these to replace regular sheets except in cooler areas. They do wrinkle a bit, but not bad. They are well worth the effort if you want great sheets for cool nights! I have had these sheets about a month. The deep pockets are perfect for my mattress. My mattress measures 16 inches. This set is substantial and seems to be very good quality. The set is softer than some of my other 1000 thread count sets and I love them. I am sure the sheets will last a very long time. I plan to get another color soon. These sheets are thick and luxurious. We ordered them for a new 15-inch mattress we purchased, and they fit great. Everything arrived very quickly and on time. No complaints so far. This is what makes this review so difficult, the depth of the pocket. I would rate these sheets 5 stars on feel and quality, but would have to give them a 1 star rating on fit. We absolutely love the feel of these sheets. They are heavier so they do not slide off. The stitching is well done and after the first washing they just felt soft. We have a plush mattress that is 14 deep and the product description states the fitted sheet is 15 inches to fit mattresses up to 18 inches deep; this is so not true. I can barely get the corners over the edges of the mattress and after a night or two they pop off leaving the fitted sheet loose on the bed. Anyone with a pillow-top mattress should be cautious, but if you are using a standard mattress these sheets are wonderful. 5 years ago I purchased 1000 count sheets from Overtsock.com and was very pleased with the product. I washed them many times over the years with only good results. Recently I purchased these new Egyptian Cotton sheets, washed them once in cold water and dried them on low and the seam split open along the top. I don't know if this is a bad batch or not such a good manufacturer ("Luxor Treasures"). Anyway, my money was promptly refunded and I will continue to look for sheets on Overstock.com. I rarely write reviews, but these sheets are such a great value I couldn't resists. I'm ordering a second set now. These sheets are thick and the Burgandy color is very rich. I can't believe how crappy my old set (600 TC) was compared to this. It's like night and day. Sheets are very true to fit and comfortable. These sheets are definitely worth the purchase. They are deep as inidcated and fit my king size bed perfectly. If you have dogs that love to cuddle in bed, keep them away from the sheets as they are easily torn. At the risk of being redundant, 1000 count sheets are an investment and a project. I washed this set two times and I know I will be happy with them on my bed tonight. However, I will be really happy with them in a year and thrilled in 3 years. That is just how it goes with sheets at this thread count. I can tell that these will have a nice smooth silky finish and will be luxurious once they mature. If you want immediate gratification, get a lower count sheet, there is nothing wrong with that. But if you enjoy true comfort and indulgence and are willing to wait and experience the joy of watching a great sheet mature, these are for you. I ordered the Egyptian Cotton 1000 Thread Count Cal King Sheet Set in burgandy. These sheets are oversized and fit my new premium mattress perfectly! No tugging & pulling to get them onto the mattress. There's room to spare with the extra deep pockets. The fabric is unbelievably luxurious and better than I've experienced even in the top 5 Star Hotels! The burgundy color is delightfully regal...I feel like royalty! The sheets just get better wash after wash and look like new after multiple washes. I think these sheets will last a lifetime without any signs of wear. I heartily and without reservation recommend these sheets. I've ordered more and plan to be exclusive to this product. No need to buy sheets anywhere else!!! These are not as smooth as I would like. They are, however, acceptable. After a couple of washes they are a bit softer. I have a Cal King mattress. The fitted sheet has plenty of depth, and I do not have my typical struggle to pull it on over the corners. The flat sheet has way plenty on the sides, but just enough for the length. I wish sheet manufacturers would give in and acknowledge that Cal King is narrower and longer than regular King. I wouldn't buy them again because I've had better for the price. These are the best sheets ever. Thick, soft, expensive but wonderful! I have bought 4 sets of these sheets different times.This last set is terrible.Thin,itchy and quality is just not there.Why change a great thing. These are amazing! They get softer with every wash. Anything above 1000 thread count are too heavy, anything below are too thin. I have bought several of these (white) for the last 6 years and they always come clean and hold up well. They do shrink some if dried on high. If you have hot flashes these are the sheets for you! Get a down comforter and the same cover as the sheets! They are very cool and comfortable. High quality, extremely soft. Beautiful sheen but not flashy. Fabric is silky to the touch. Fits a pillow top mattress perfectly. Color is consistent with what was online. I paid so much for these sheets, and I loved the way they felt. but, the elastic ripped after less than a year. I expected more for the money. Soft and heavy sheets as we had hoped. Usually purchase 1500 count and it is good for winter. These are perfect for summer months. "I'd like another set of pillow cases. Are they available?" The pillowcases can be found under item number 11208017. "Do you sell just the fitted sheet (Queen, taupe)? I love these sheets, but my fitted sheet wore through and I'd like to replace it. The rest of the set is in great condition." "I measured my mattress as 15". In the description it says it fits a 15" to 18" mattress. Then in the king bed description it says its 15". Which is it? I do not want a baggie bed. I want the perfect fit. Can someone tell me if they have a 15" mattress how it fits their bed?" My mattress is 15â thick and the fitted sheet fits perfect. I donât think it would fit anything thicker than 15â. It is a tight fit. "I would like to know the dimensions of both queen and king. I would like to use a flat sheet for a backing on a quilt Need to use a flat sheet and how deep the top overlap hem is." "I ordered these sheets in May 2015. I love them, but the bottom fitted sheet is not deep enough for my non pillow top mattress. It is so much work to get them on, and then they do not fit over the side of the mattress and keep it exposed. The bottom sheet has torn and needs to be replaced. So I need to order another set.. wish I could order fitted sheets separately. I am surprised that these heavy sheets worn so quickly. Do you have this fitted sheet with an even deeper pocket?" Did you see "deep pockets" before you bought them? I suggest you buy the 1500 thread count which fits where others don't (i have a very thick mattress protector so i ran into this problem with the 650 count sheets. Get the 1500 count sheets to be sure of a good fit. I have Superior 1200 thread count deep pocket sheet set and the sheets fit my 16 inch mattress just fine. I always check to be sure the set has deep pockets that fit up to 18 inches. I had the same problem. I ordered two sets at the same time -- one set: the fitted sheet was so big I couldn't keep it tight and got all bunched up under me while sleeping, top sheet short (could barely tuck it in at the bottom) and narrow (barely kept my husband and me covered -- the other set: the fitted sheet was extremely small and eventually split and the top sheet was very large. Love the sheets but no consistency between sets. Will be ordering something else. "Do you carry Twin XL 1000 thread count bottom sheets and/or duvet covers same size?" We do not currently offer Twin XL in a 1000 thread count. However, we do 1200 thread count such as ITEM#: 17659955. "What is the total weight for these sheets"
Hello ElizabethNI G., the full size sheet set is approximately 6 pounds, queen set weighs approximately 7 pounds, king set weighs approximately 8 pounds and Ca King weighs approximately 8 pounds. I hope this info helps. Thanks for shopping with us!